Love the stain remover thing. "Mom, where do you keep the stain remover stuff?" Here's hoping your happily working away! Ha! I LOVE that photo of your cat plucking the guitar strings!!!! That is so cool! Janet - No particular song. He just plucks any old string as far as I can tell. A Free Man - Would you believe I STILL have one sick? Today makes a full week of one child or the other with fever. Waxing eloquent about wax. This is why I love your posts also because they are funny and well-written but mostly it's the wax. That is a very talented cat. Do they have a reality show for America's most talented pets? Your cat should be on that show. One of my first experiences with "Hyporcrisy" was when I was in the mega-food market and for some reason or another, I got to reading labels and discovered that the contents of a tin of Slim-Fast diet drink was EXACTLY the same as the contents of a tin of Nestle's Quick chocolate drink for children. Only difference, Slim-Fast = $3.75, Nestle's Quick = $2.10. Gotta love the interaction between capitalism and the ego driven American consumer. You sure do learn about stuff when your kids are sick but then...you learn about stuff in general! Hot wax does work better than cold wax and what freaked me out is wax that smells like dessert. 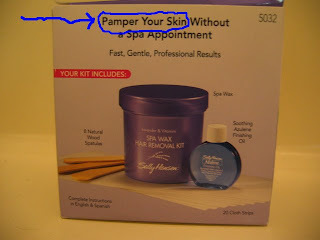 I'm referring to the wax that removes unwanted hair of course! I once tried "white chocolate wax" that was water soluble. It's purpose seemed to be to make a big mess by sticking to what you didn't want it to stick to. I'm not a big white chocolate fan (more super dark chocolate) and this wax didn't help. Regarding removing this wax...it depends on where you spill it. Usual trick is to use and ice cube on it so it hardens and then you can chip it off. If you spill it on a rug and it soaks...try the ice cube trick then if there is still stuff, cover with a rag or maybe even a paper napkin and use a hot clothes iron over the cloth to melt the wax into the rag. There's one benefit to being Chinese - little body hair! I'm not sure how the Chinese guys feel but as a Chinese woman...shaving and large amounts of waxing...eeek! Oh my gosh - I forgot I was this far behind in comment answering! Alf - I think so too! Bruce - How strange!!!!!!!! I wonder how they get Slim fast to taste so awful then!!?!?!? Ms.Q - Yeah, I've tried the wax a couple more times and although I LOVE how much faster it is than the cold wax strips, I still can't help making a gigantic mess no matter how careful I am. I still have a good bit left in the jar, so I guess I have awhile before I have to decide whether or not to buy it again.